This article was written for the Japanese magazine, Flyfisher. I daresay it offers good advice for any angler that fishes the Madison in the fall. 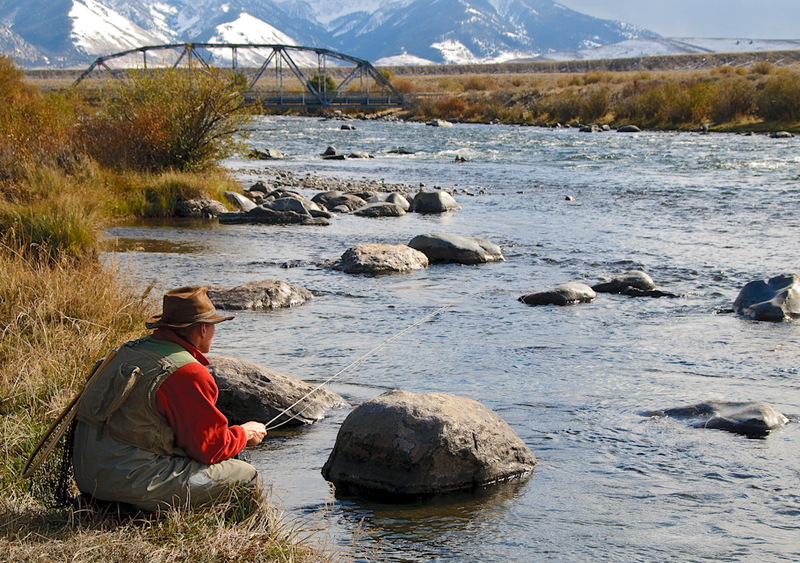 It’s no secret that Montana’s Madison River is one of the world’s great trout streams. It holds large numbers of sizeable trout, and in the stretches below Quake Lake its shallow, rocky character lends itself perfectly to fly fishing. All the major fly hatches are present and abundant. Whether it’s stoneflies, caddisflies, mayflies, or midges, the Madison has multiple species of each that provide delightful seasonal angling opportunities. 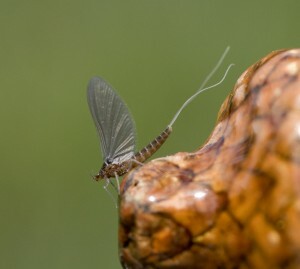 A classic example are Baetis mayflies. Though they aren’t among the river’s largest flies, Baetis are certainly among the most important. Various Baetis species emerge on the Madison every month from March through November, but their peak activity occurs in April and May, August, and October. Among these periods, the best—by far—is October. (As a bonus, this is the season when fishermen are fewest). Baetis emerge in October on an everyday basis and in prodigious numbers. Since there is little other insect activity this time of year, the fish pay even more attention to these tiny mayflies than they otherwise might. The most important Baetis species on the Madison is Baetis tricaudatus. Classic Baetis water on the Madison. Note that the angler is seated to remain out of view to the fish. Baetis tricaudatus are particularly interesting in that they are a size #18 to #20 in the spring, size #20 during August, and size #22-#24 in October (many Baetis species have multiple generations per year). Even though it’s the same species hatching, the different generations vary in size as a function of the amount of time their nymphs spend maturing. It might seem strange that such tiny flies can be so important on a big, brawling river like the Madison, but they are. Trout congregate in the slower, quieter pockets of the river most every October afternoon to sip Baetis nymphs and duns. 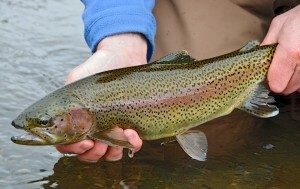 For aficionados of rising trout this is an unparalleled opportunity for surface fishing with small dry flies and nymphs. Even though Baetis emerge regularly throughout October, certain days experience heavier hatches than others. Weather seems to be the overriding factor. Good hatches can occur in any weather condition, but the best hatches always take place under overcast skies. Add rain or snow (either is possible—and likely—in October), and you are all but guaranteed several hours of fine Baetis emergence and rising trout. Afternoon is the time; between 1:00 p.m. and 5:00 p.m. is when the most action takes place. Windless days are ideal, but rare. My favored rod for this fishing is a slow action, nine foot, four-weight. This kind of rod allows for excellent line control, will cast a very short line easily, and protects the 6x tippets necessary to fool the larger fish. I like the four-weight line for its inherent delicacy. While it’s possible to use heavier lines, a four-weight also allows me to fish a short leader—no more than ten or eleven feet—without sacrificing delicacy. A leader of this length also handles better in the wind and in the small pockets the fish typically lie in. Casting distances in this fishing should be short. Ten to fifteen foot casts are common; twenty-five feet is a long cast. This is where most amateur fishermen make a critical mistake. They stay too far back from the fish, making unnecessarily long casts over conflicting currents. 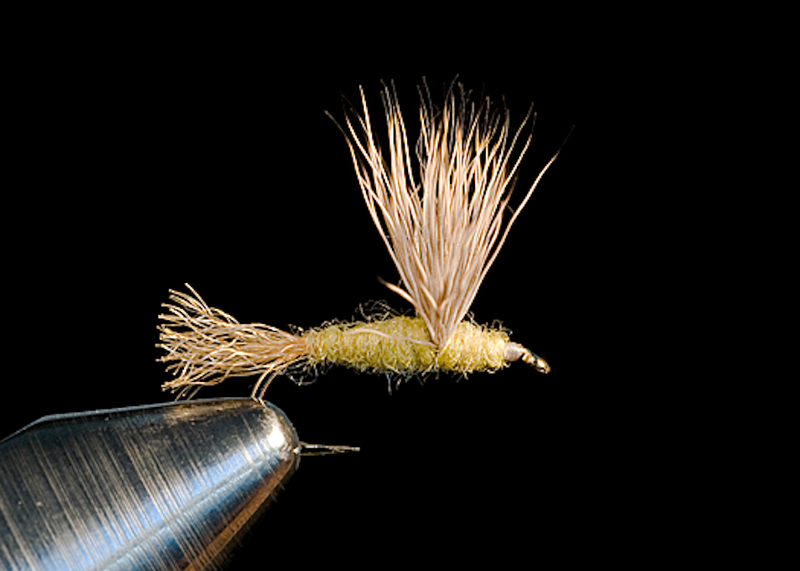 A dragging fly quickly results, killing their chances and oftentimes spooking the fish. To eliminate dealing with multiple currents I like to get as close to the fish as possible. This means staying low during the approach (I spend a lot of time kneeling). I also approach the fish from directly downstream. This allows for a straight upstream cast, keeping the line in a single current lane and (mostly) alleviating drag problems. I find that when I’m comfortable with my casting position I’m sometimes casting nothing but leader. Approaches like this require stealth, to be sure, but they make the fishing much easier. Two feeding fish. Larger fish typically spend their time nymphing, like the rainbow in the upper left. The fish in the lower right has just taken a dun. Casting short distances helps not only in getting a good drift, it also makes tracking the fly easier, whether visually (dry fly) or by estimating its position (nymph in the film). When natural flies are plentiful and multiple fish are feeding side by side, keeping close tabs on your fly is essential for determining when it is taken. Too, short casts are more accurate and more easily controlled when wind is an issue. Fly choice is personal. Many different Baetis patterns work, but I almost always begin with a Sparkle Dun. This emerging dun imitation floats well, is visible, and takes trout whether they are feeding on duns or emerging nymphs. It has been an effective Baetis imitation for over twenty-five years. A Baetis-caught rainbow. The dark coloration is typical of October. I think most serious anglers will find delight in fishing an autumn Baetis hatch on the Madison. It’s a real treat to see tiny mayflies sailing the currents, trout rising in every pocket, and few other fishermen. Even when the weather is at its worst and I know I’m going to suffer, one glimpse at the feeding fish is all it takes to convince me to string my rod and give it a go. May we all be so lucky as to get that chance.